Five months after McDonald’s announced it would cut eight menu items and narrow extra value meal options from 16 to 11 combinations, the fast food giant has finally started showing some of its less popular products the door. 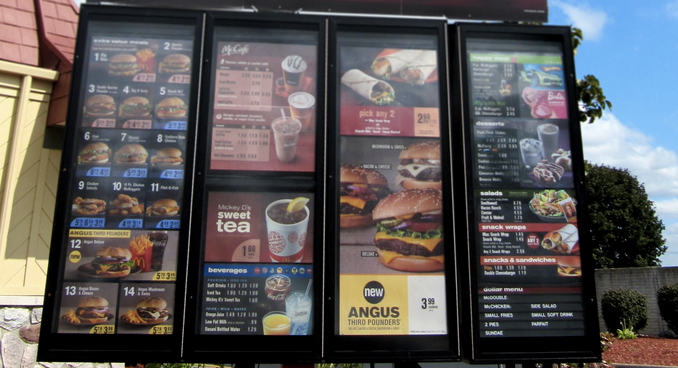 Bloomberg reports that in an effort to speed things up in the service line, the Golden Arches nixed nine menu items during the first quarter of 2015. Menu items that got the axe include Deluxe Quarter Pounder burger, six chicken sandwiches, and the honey mustard and chipotle barbecue snack wraps. A spokesperson for the company tells Bloomberg that the items disappeared from restaurants as part of a “rolling removal,” meaning restaurants discontinued the meals when they ran out of supplies. Despite paring down its menu, McDoanld’s has in recent months added several items either on a permanent (Chicken Select tenders) or limited time basis (Sirloin Third Pound burgers). Additionally, the company began testing an all-day breakfast menu at nearly 90 stores in the San Diego area. McDonald’s new CEO Steve Easterbrook told investors last week that the fast food chain would continue moves to simplify its menu amid the company’s growing tests for new produces, Bloomberg reports. Easterbrook is working to create a turnaround at the company after years of sagging sales and troubles reaching new customers. He’s expected to unveil his plans next week.